"One of the more momentous books of the decade." Nate Silver is the founder and editor in chief of FiveThirtyEight.com. "Mr. Silver's breezy style makes even the most difficult statistical material accessible. What is more, his arguments and examples are painstakingly researched..."
"Nate Silver is the Kurt Cobain of statistics... His ambitious new book, The Signal and the Noise, is a practical handbook and a philosophical manifesto in one, following the theme of prediction through a series of case studies ranging from hurricane tracking to professional poker to counterterrorism. It will be a supremely valuable resource for anyone who wants to make good guesses about the future, or who wants to assess the guesses made by others. In other words, everyone." "Silver delivers an improbably breezy read on what is essentially a primer on making predictions." "Silver explores our attempts at forecasting stocks, storms, sports, and anything else not set in stone." 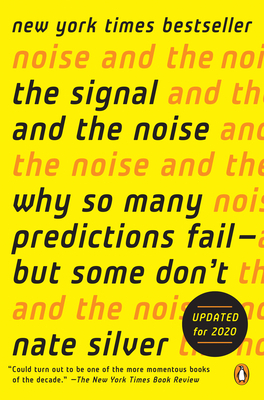 "The Signal and the Noise is essential reading in the era of Big Data that touches every business, every sports event, and every policymaker."